Concert goers at Gorge concert trashed the place – one Fort Lewis resident was among the arrested. Click here for the PI report. 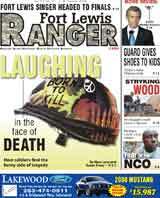 FORT LEWIS, Wash. (AP) – The Army has laid out its case against an officer from Hawaii facing possible court-martial for refusing to go to Iraq. Today at Fort Lewis, Washington, prosecutors showed video footage of First Lieutenant Ehren Watada calling the war illegal.